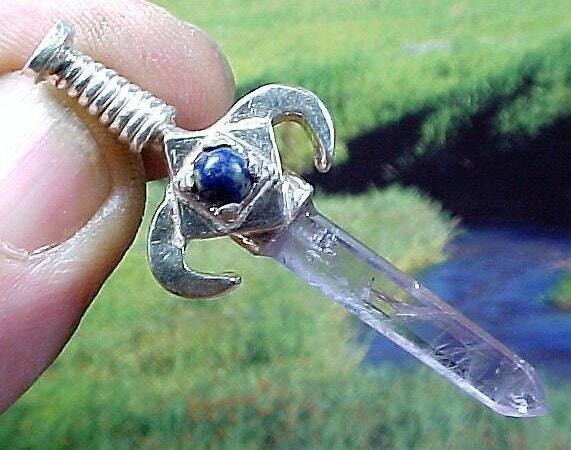 A custom order for Jesse W.
You will receive a similar Amethyst blade and Lapis Lazuli set in a Sterling Silver Swords of Stone Pendant that measures approx. 2x7/8" including the hidden bail. This sword, symbolizing the bringing of Truth, Peace and Justice into our daily lives, was first carved by Dino into the design you see from wax, and then cast in .925 Sterling Silver. It was then hand-made by Dino with a hidden bail that is built into the design. In addition this hilt carries a beautiful faceted 5mm Lapis Lazuli to further enhance this Sword. AMETHYST is the traditional birthstone of those born in February. It is a variety of Quartz Crystal with a high concentration of Manganese and additional amounts of Iron and Aluminum which provide for the purple color variation. It is superb for defending against psychic and negative attack, and is a wonderful companion stone for those who are seeking spiritual enlightenment. It is also a great bestower of strength, stability and peace in stressful situations, being a very strong tool for transmuting negative to positive energy. Amethyst is a terrific choice for those wishing to instill more patience in their lives, reminding us that we always have "enough" time for everything. In addition, and in accordance with the teachings of the Medicine Wheel, it is also the "grounding stone" for those born under the sign of Virgo. LAPIS LAZULI, believed to have existed since before the beginning of time, is a wonderful companion stone for those wishing to explore the possibilities of hidden psychic or healing abilities. It can be instrumental in opening the "third eye" and is a stone of "total awareness" allowing its companion to explore the celestial and psychic realms with an open heart. Lapis is also known to be an awesome companion for those wishing to explore the Sacred Ways and healing practices of the ancient lineages. In addition, it is an excellent complement to those seeking to overcome depression, helping to bring a sense of serenity and self-acceptance into one's life and, as a protection talismans for travelers, it has also been very effective in helping to counter motion sickness, dizziness and vertigo.